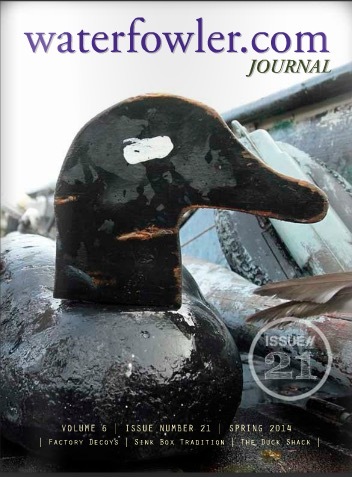 BISMARCK, N.D. — North America’s spring duck population is at a record level, and the birds returned to find a high number of ponds on the breeding grounds, according to the 2014 Waterfowl Breeding Population and Habitat Survey released today. The annual spring survey, which has been conducted jointly by the U.S. Fish and Wildlife Service and Canadian Wildlife Service since 1955, puts the breeding duck population at 49.2 million, surpassing the previous high set in 2012 and 8 percent ahead of the 2013 estimate. In addition to record breeding duck numbers, more good news lies in continued wet conditions. Most of the Prairie Pothole Region, which encompasses much of Alberta, Saskatchewan, Manitoba, the Dakotas and Eastern Montana, is very wet. The May pond count, which registered a soaking-wet 7.18 million, is 40 percent above the long-term average. Better still, many prime duck production areas are even wetter today than when the survey was conducted. That’s unusual. Most years, temporary seasonal wetlands begin drying out by June. The one notable dry spot was eastern South Dakota. Breeding mallards (10.9 million) and gadwalls (3.81 million) are at the second-highest levels in the history of the survey. Green-winged teal (3.44 million) and blue-winged teal (8.54 million) came in at the third-highest tallies since 1955, while shovelers (5.28 million) and redheads (1.28 million) are at record-high breeding population levels. 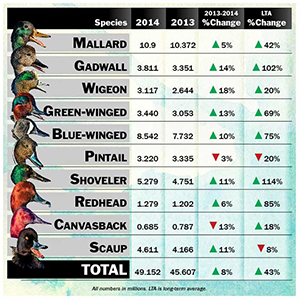 Wigeon increased 18 percent to 3.11 million, while scaup added 11 percent to 4.6 million. Wigeon are now 20 percent above the long-term average, which is notable given concerns over a declining population trend in the 1990s and 2000s. Of the 10 key survey species, only pintails and canvasbacks declined. Pintails dropped by 3 percent to 3.22 million, while canvasbacks were down 13 percent, registering at 685,000. Strong breeding duck numbers and very good water conditions should translate to more ducks in the fall flight, but it’s still not a guarantee of more birds over every duck hunter’s decoys this season. Local conditions during duck season always have a huge impact on hunting success. Still, considering the high duck index and excellent water, the many millions of ducks will be out there this season, somewhere in North America.